If your problem with the Star Wars prequels was that they took themselves too seriously, then you’re in luck. 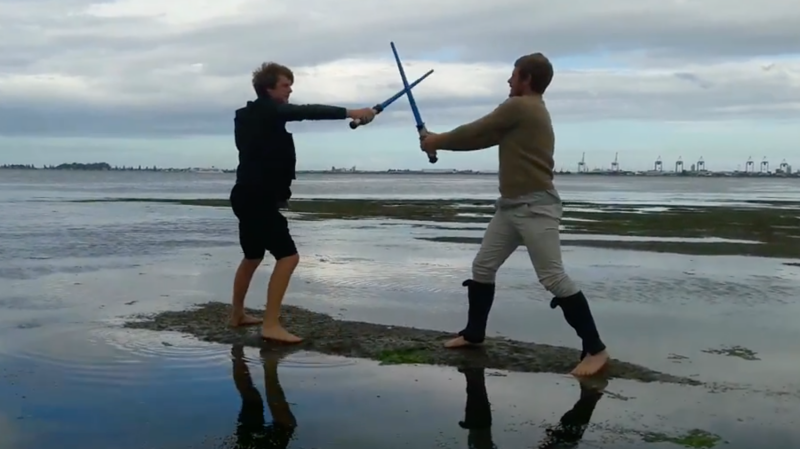 One Star Wars fan has released a full-length, homemade recreation of Star Wars: Revenge of the Sith, and it’s absolutely absurd. The work of a couple of guys with some toy lightsabers and a lot of spare time, this version of Revenge of the Sith is more of a demake than a remake. The sets are living rooms, car backseats, and an incredibly dreary beach. The sound effects are canned. The costumes are terrible. And the whole thing is played for laughs. By embracing the glory of terrible production values, this recreation straddles the line between tribute and parody. Watching, one can’t quite tell if these guys think Revenge of the Sith is genius or awful. But you can tell creator Tim Hoekstra and his fellow filmmakers are having an absolute blast. I’m going to have to call them out for the lack of scene transitions, though. Those are a George Lucas staple. Check it out, and make sure to stick around for Hoekstra’s interpretation of the infamous “I have the high ground” scene—it starts at 1:30:10.